Y'all know I love greyhounds, right? Part of it is that my beloved doggy, Tanner, reminds me of a greyhound when he runs. While I doubt that Tanner, who was adopted from an animal shelter when he was a small pup, has any greyhound lineage, anything that reminds me of him makes me smile. 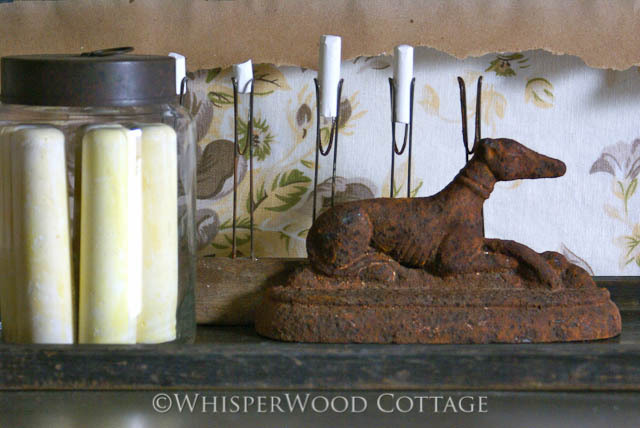 The other part of it is the vintage Greyhound sign in the guest bedroom, which I found at a flea market a couple years ago...love it! Sticking with my intention to discover and create my own authentic style and inspired by my vintage Greyhound sign, I added a little touch of greyhound to the craft paper chalkboard in my studio. While I was at it, I thought I'd leave an inspiring message for you on finding and creating your own authentic style! Move your mouse over the image to see the message. 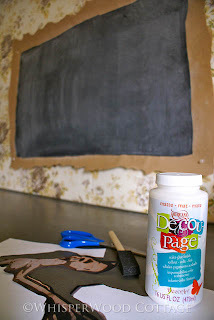 To see how to make your own, check out my featured post, Amy's Decoupaged Greyhound Chalkboard featuring DecoArt & Rockler, at The DIY Club. Greyhounds always remind me of the Art Deco period. They're so elegant. 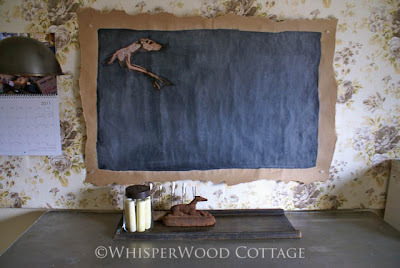 I like your rusty greyhound and the chalkboard applique! Amy, thanks for signing up to be a follower of our blog. I love your rusty greyhound chalk holder! My style is pretty eclectic. I buy or find what I like and then fit it in with what I already have. Each room has it's own style. One of these days I will get around to posting pictures of my rooms. You know I love the greyhounds too. When you are ready, you should look into getting one, they are the best. I'm looking to get an Italian Greyhound in the next couple of weeks. See my blog. She'll keep her BIG sis company. What a great old rusty greyhound. I have a metal Springer Spaniel doorstop that I love and keep looking for more. I'll take an dog as long as it's cute!